Last week I sent you an email with a Survey Funnel Case Study. It’s from one of my private students – who started from absolute NOTHING in a Pet Niche. If you’d like… I’ll try to post an update in August when we have full month data so you can see how the month played out. The niche is a Pet Market (specifics are withheld to protect my student’s – and my – financial interests). PHASE I – This is the “Deep Dive” Survey Phase. Where we’re gathering data – and spending a little money on advertising to drive traffic our Deep Dive survey. PHASE II – This is “Optimization” Phase. Here we’ve launched the Survey Funnel style funnel, we’re driving traffic to it, but we’re not yet profitable. We’re STILL LOSING MONEY here. In this case, the only revenue we were generating was off of ONE product, through SVS (Same Visit Sale) ONLY. No email followup. No “Profit Maximization” upsell sequence. And under optimized headline and landing page design. PHASE III – This is the “Tipping Point” Phase. Here you see a RADICAL shift in the economics, and we are IN THE BLACK. In fact, here we’re making better than 2:1 on our advertising. We have our funnel down. And by the way, in case you’re wondering about the relatively SMALL numbers? We’re ONLY advertising on Yahoo/Bing. Which represents < 20% of the market – when we factor in Google Adwords. We used Yahoo/Bing to optimize the funnel, work out all the kinks, and now we’re about to SCALE by adding Google Adwords as our next traffic source. My margins actually improve. So I wouldn’t be surprised if this translates to an $8500/mo in PROFIT business, which would put things around $100K annualized. Not too shabby for a relatively small, obscure Pet Niche. So what’s this got to do with YOU? 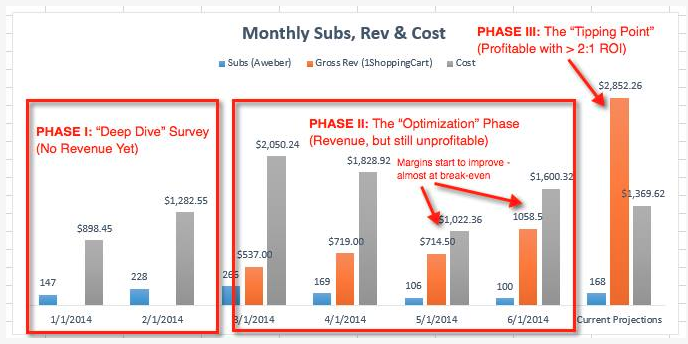 Lose faith or at least QUESTION the process as they’re going through PHASE II – the “Optimization Phase” where you’re not QUITE profitable yet. In fact, one of the BIGGEST MISTAKES I see is when people get to this point – and they GIVE UP. This is that whole “Three feet from gold” thing Napoleon Hill talks about in Think and Grow Rich. This is what that looks like in real life. So when you get to that point? To go from “Losing Money” to “Wildly Profitable” – you DO gotta do a few things. It ain’t just happening with magic and “intention”. Roger gets the credit with for sticking to the plan – and ruthlessly implementing. He followed the system. Trust my guidance. And he’s rockin’ and rollin’. If you’re going through my Survey Funnel Formula training – then you’ve got the blueprint too. You just gotta put one foot in front of you – like Roger. And if you want to work with me one-on-one to help accelerate the process and DRAMATICALLY increase your odds of success? It ain’t cheap. It’s $2000/mo + 5% royalty on gross sales for bi-weekly calls. And I’m pretty much booked up through 2014. But if you ARE interested – get yourself on that list. Because whenever I DO make spots available – they go fast. Last time, I made 2 spots available and they were snatched up in less than 45 mins after opening them up. So I’ll leave you with that for now. The “Tipping Point” is nigh.